CR=complete response; DoR=duration of response; ORR=overall response rate; PR=partial response. 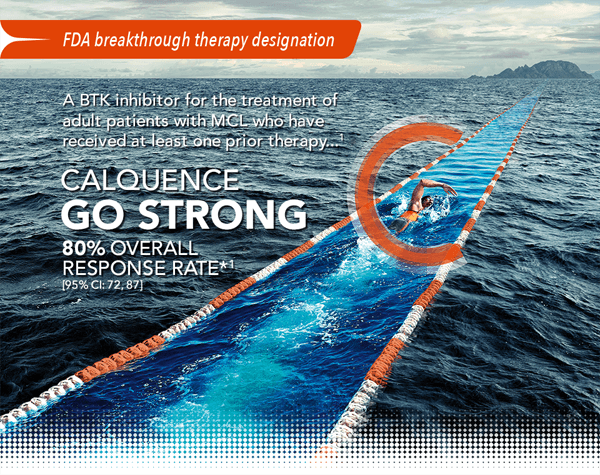 CALQUENCE is a registered trademark of the AstraZeneca group of companies. This communication is intended to keep ION members current on late breaking events. It may contain confidential information such as pricing, rebate, and other discount arrangements being provided exclusively to ION members, and as such is intended solely for the use of the addressee. If the reader of this message is not the intended recipient, you are hereby notified that any dissemination, copying, distribution or other use of this material is strictly prohibited. In the event that you have received this material in error, or wish to opt-out of any future emails, please Go Here or notify the sender immediately via email or telephone at 866-565-1070 and destroy all copies. Thank you.